When President Donald Trump took office in January 2017, Alaska Republican Lisa Murkowski had been a member of the United States Senate for 15 years. She’d pulled off a historic write-in campaign, built a reputation as someone who thinks deeply about policy, and helped pass a sweeping bipartisan public-lands deal. But a year after gaining control over two of the Senate’s most influential energy and natural resource committees, Murkowski had made little headway in her plans to develop Alaska’s protected lands and waters. Three changes in particular had eluded her. The federal “roadless rule” that spares old-growth forest in Southeast Alaska’s Tongass National Forest survived litigation, and Murkowski’s efforts to bypass it legislatively had fizzled. The Aleutian village of King Cove was still cut off from the rest of the world by the Izembek National Wildlife Refuge. And one of President Obama’s executive orders kept the coastal plain of the Arctic National Wildlife Refuge closed to drilling. Now, with help from an exceedingly development-friendly administration, Murkowski is successfully hitting back—and ushering in huge changes to some of America’s wildest landscapes. Nicole Whittington-Evans, Alaska regional director of The Wilderness Society, says she’s never seen “anything comparable to the full-on assault of Alaska’s land and waters that we’ve seen in the last year. In the past year, this has allowed Murkowski to oppose President Trump’s Cabinet picks, publicly defend Planned Parenthood, and refuse to overturn Obamacare, which would have cut Medicaid funding in Alaska. Her opposition was a key reason why that legislation failed. And it’s why GOP leaders are now willing to tailor legislation to gain Murkowski’s coveted vote. So when Congress drew up a massive tax overhaul in December, the bill included a sweetener that Murkowski couldn’t refuse: a provision she’d written to allow drilling in the Arctic National Wildlife Refuge (ANWR). While much of the 19-million-acre refuge is off-limits to drilling, a 1.5 million-acre parcel known as the coastal plain escaped wilderness designation. It holds an estimated 10 billion barrels of recoverable crude oil. It’s also home to polar bears, migratory birds and caribou calving grounds, and protecting it from drilling has been a priority for environmentalists for decades. Alaska Native groups are divided on the issue, torn between economic development and dependence on intact ecosystems, and even the oil-hungry GOP has mixed opinions. In the past, moderate Republicans have voted down measures to open ANWR, and in 2017, a dozen House Republicans urged their party to drop Murkowski’s provision to allow leasing on 2,000 acres of the coastal plain. With Murkowski’s support, however, the tax bill passed both chambers of Congress and was signed into law. It marks the first time in more than 35 years that ANWR has been open to oil and gas companies. “Honestly, I think some people were stunned that it actually happened,” says Kara Moriarty, CEO of the Alaska Oil and Gas Association. Opening ANWR to development is part of a broader effort to ramp up America’s Arctic oil production, which has decreased from 2 million barrels a day in 1987 to around 500,000 today. That and the low price of oil have plunged Alaska into a fiscal crisis and cost the state close to 10,000 jobs. 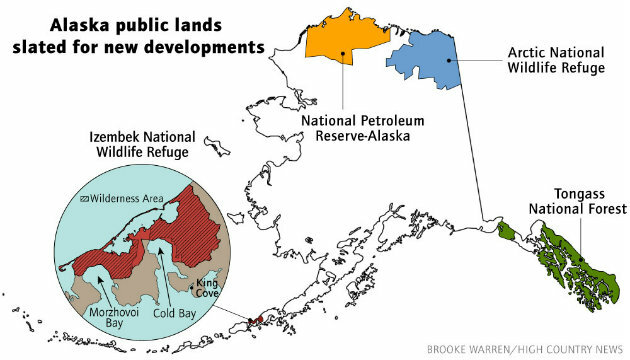 With Murkowski’s blessing—and possible urging—Interior Secretary Ryan Zinke has also made every eligible acre of another massive Arctic refuge, the National Petroleum Reserve-Alaska, available for leasing. And the Trump administration has proposed opening nearly all of Alaska’s oceans to offshore drilling, including Arctic hunting grounds important to Iñupiat whaling communities. Expanded drilling is only part of Murkowski’s vision to unshackle Alaska’s natural resources. Since her arrival in Congress, another pet project has been to build a 12-mile road through a wilderness area in the Izembek National Wildlife Refuge, a relatively small wetland that’s home to grizzlies, wolves and entire populations of shorebirds. For years, Murkowski has tried to exchange land within the refuge for land outside it to build what she calls a “medical access road.” The road would let the 925 residents of King Cove access a nearby airport, as well as expedite shipping between King Cove’s fish processing plant and major ports. The Wilderness Society and other conservation groups believe that the road would do irreparable damage to wildlife and set a precedent for development in other protected wildernesses. They also believe there are better options for medical access. Murkowski’s past efforts were blocked by former Interior Secretary Sally Jewell. But on Jan. 22, Murkowski had her revenge: While the government was shut down, Zinke signed off on a deal to build the long-awaited road through Izembek. Meanwhile, Murkowski is also using her chairmanships to reinvigorate logging in the Tongass National Forest, a 500-mile archipelago of giant trees and mountainous glaciers where her family lived in the 1960s. At the time, logging drove the economy of Southeast Alaska, but today, fewer than 1 percent of the region’s jobs are connected to timber. Instead, fishing, tourism and other industries are booming. Buck Lindekugel, attorney for the Southeast Alaska Conservation Council, thinks Murkowski is unwilling to recognize these new economic realities, as evidenced by two riders she’s tacked onto an Interior spending bill. One would exempt Alaska from the roadless rule, which blocks the road-building needed to access 2.5 million acres of Tongass old-growth forest. The second would scrap a progressive 2016 plan that recognizes this rule and phases out old-growth clear-cutting, returning forest management to an outdated plan that offers fewer protections. Murkowski has also introduced a separate bill to transfer federal land in the Tongass to Alaska Native Corporations, where it could be logged more quickly. And Murkowski’s reach isn’t limited to the 49th state. What happens here sets the tone for what’s permissible on public lands elsewhere, says Whittington-Evans. Plus, the senator hopes to use her influential chairmanships and GOP majority to pass one more controversial measure: a massive energy bill that would modernize the West’s electric grid and permanently authorize the Land and Water Conservation Fund, while also expediting pipeline construction and making it easier for companies to access natural gas, oil, renewables and hydroelectric power on Western public lands.